Another revival comes up short: Jason Miller’s That Championship Season. It’s about the twentieth annual reunion of a prize-winning small-town high-school basketball team at the house of their coach, a ritual attended by only four of the five. George, the town’s smug mayor, is up against a strong candidate in his bid for re-election; James, the junior-high-school principal and his campaign manager, secretly harbors higher aspirations; James’s brother, Tom, the town drunk, has seen a bit of the world and enjoys needling the others with not inapposite sarcasm; Phil, who inherited his father’s strip mines and is the town nabob, plays around with the women, not least the mayor’s wife. Martin, the missing teammate, abstains because he is most aware of the shoddy tricks by which the coach won that silver cup with their names on it, proudly displayed on his coffee table. Coach (he has no other name) is a petit bourgeois full of quasi-philosophical bluster, still trying to run his overgrown but undermatured boys. Beneath his bluff exterior, he is a narrow-minded reactionary with merely some financial success. The 1972 play feels in 1999 like our twenty-seventh reunion with petty sinners whose sins have shrunk further. They have only gambled away morally a puny trophy, a mere paper cup compared to the cup of iniquities our politics keep forcing down our throats. Things are not helped by Scott Ellis’s homogenizing direction or the cast that, though highly capable, is not quite up to the original one. 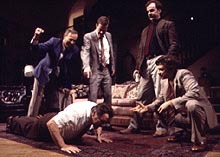 Still, there are fine performances from Michael O’Keefe, Ray Baker, Dylan Baker, and Dennis Boutsikaris. The usually excellent James Gammon, however, lacks that demonic extra something that made Richard A. Dysart, as the coach, so powerful back then.